Oh, my goodness: it can’t be 10 years already!!! And, for those of you who have never heard us, it’s high time you took the plunge, got out of your easy chair and experienced an evening of live music. This is a concert not to be missed. Yes, the Island Consort chamber choir celebrates its 10th Anniversary this year with a wonderful, at times, heart-wrenching program of classic, choral music. As the featured work, Music Director, Bruce Farquharson has chosen this occasion to stage a performance of Gabriel Fauré’s Requiem, a long-awaited wish of his. 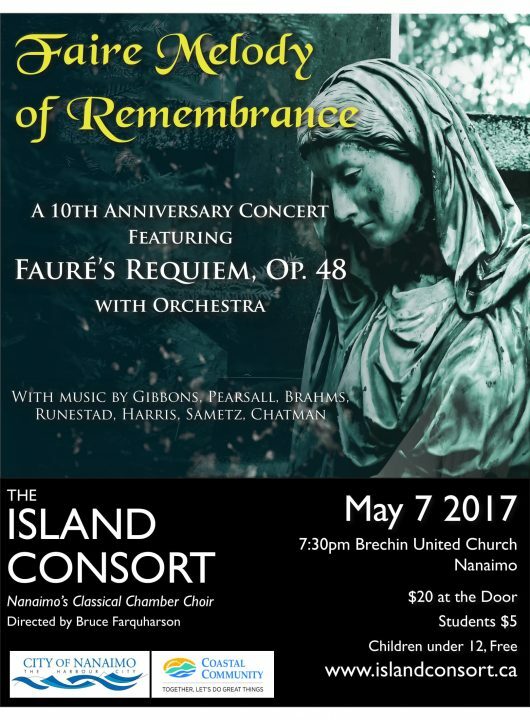 And to aid in this, an orchestra comprising Nanaimo Chamber Orchestra string players plus 2 horns, harp and organ will present the earlier 1893 version but with omission of trumpets and bassoons. With a chamber choir and a compact orchestra the work will be performed with the musical grace and balance that it deserves. Solos are to be sung by soprano, Skye Donald and baritone, Jeremy Roszmann. The concert is titled, “Faire Music of Remembrance”. In keeping with the theme, the choir will perform Orlando Gibbons’ 1612 madrigal, “What Is Our Life?” – set to a poem by Walter Raleigh, followed by an early 19th century 8-part madrigal, Robert Pearsall’s “Lay A Garland”. This leads to Brahms’ “Wie Lieblich Sind Deine Wohnungen”, one of the movements from his German Requiem. Next will be a very recent composition by American, Jake Runestad:- “Let My Love Be Heard” which has been sung to honour last year’s victims of the shootings in Paris at the Bataclan. William Harris’, “Faire is the Heaven”, composed for double choir, delivers an Edwardian musical palette set to the poetry of Edmund Spenser. This is followed by American, Steven Sametz’ contemporary “When He Shall Die” set to a verse from Shakespeare’s Romeo & Juliet. Finishing the 1st half will be Stephen Chatman’s, “And If Thou Wilt, Remember” and Aaron Copland’s “At the River”. Piano accompaniment for the latter two, plus organ accompaniment for the Brahms will be played by Jenny Vincent. The Requiem will be in the 2nd half.